Mary Flannery O’Connor was born in Savannah, Georgia, the only child of Regine Cline and Edwin Francis O’Connor. Born in a Catholic family, she lived in the South in the beginning of her childhood. During her school years Mary showed profound interest in writing. She attended the Peabody High School and joined the Georgia State College for Women where she worked as an editor for the college magazine. She continued her education in the University of Iowa. During this time period she didn’t forget her passion. Mary O’Connor attended various writers’ workshops. While studying for her degree of Masters of Fine arts in Literature, Mary published her first short story ‘The Geranium’ in 1946. She graduated the following year. In 1950, Mary became gravely sick with the same illness that had taken her father’s life. Luckily the disease was now treatable. Mary was in and out of the hospital in Andalusia; which was a dairy farm a few miles away from Milledgeville, belonging to her mother. It was here that her love was writing flourished. Mary spent the next fourteen years of her life here writing later to become the greatest short story writers of the twentieth century. Other works of O’Connor include Wise Blood in Mademoiselle, Sewanee Review, and Partisan Review in 1948 and 1949 which were chapters of the same novel which finally came out in 1952. The second novel The Violent Bear It Away was published in 1960. Both these novels had a similar subject matter. Both the stories revolved around religion. Many believe it had to do with the fact that Mary O’Connor was born in a house that was opposite to French Gothic Cathedral of St. John the Baptist, which also gave rise to the recurring comment, that Mary Flannery O’Connor “was conceived in the shadow of the cathedral”. One of her novels ‘Wise Blood’ later became a film. Mary called her work ‘stories about original sin’. Her writing can be described as being about the action of grace in the world, about those moments in which grace, usually in the form of violence, moves down on her comically content characters, sometimes opening their eyes to an atrocious comprehension and sometimes killing them. Many readers find O’Connor’s identification of the transcendent with an aggressive force repulsive and even more outrageous than the stories themselves. O’Connor on the other hand believed that a fierce shock was necessary to bring both her characters and her modern materialistic audience to knowledge of the potent reality of the realm of awe-inspiring mystery. Mary also published two other books of short stories: A Good Man Is Hard to Find (1955) and Everything That Rises Must Converge (1965). Her writing style as inspired by the grotesque, O’Connor has been quoted saying “Anything that comes out of the South is going to be called grotesque by the northern reader, unless it is grotesque, in which case it is going to be called realistic.” She wrote more than a 100 book reviews and her letter written to her best friend formed a book called ‘The Habit of Being’. 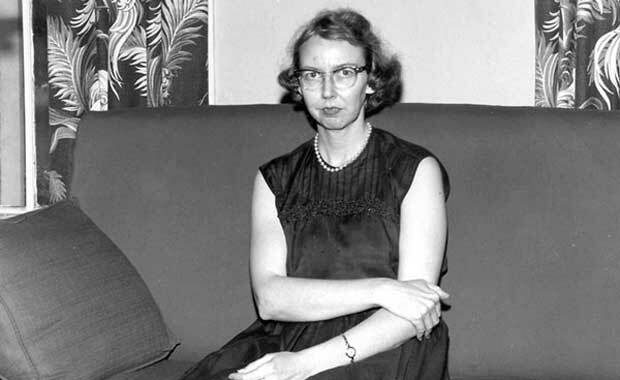 After fighting lupus for more than ten years, Flannery O’Connor died on August 3, 1964. She received an O. Henry Award in 1957 and the National Book Award in 1972 for her immense contribution to the world of English literature.